Over the last 5 years or so America has become the scene of an opioid pandemic. The unscrupulous and unethical practices of Big Pharma influenced the medical community which in turn began prescribing powerful opioid drugs like Oxycodone and Hydrocodone to a massive number of patients. In turn, with prescriptions of these narcotic painkillers given out with little oversight and then flooding the streets, America began to see a horrific increase in the number of heroin users, drug overdoses and overdose deaths. People who became hooked on prescriptions and fell into the grips of addiction, once cut off from prescriptions from their medical providers began to turn to the cheaper and more accessible heroin. With an increase in demand, heroin suppliers and low-level street dealers began to maximize product and profits by searching out alternative means to “cut” their product. They found the drug Fentanyl. Fentanyl is a synthetic opioid medication that is known to have a rapid onset and short duration of action upon the user. The drug is considered to be 50 to 100 times more potent than morphine. The drug was first made in 1960 and throughout that decade utilized in medicine as a general anaesthetic. In the 1990’s it began to be used for cancer patients and other patients with terrible chronic pain to relieve symptoms and improve quality of life. This is known as palliative treatment. As of 2012, fentanyl was te most widely used synthetic opioid in the medical industry. While fentanyl can be used on its own as a recreational drug, it has become commonplace that street level heroin is being cut with fentanyl. Due to its powerful effect on the user, fentanyl-cut heroin is responsible for thousands of overdoses each year since 2000. Typically what happens is a user will purchase and use what for them has become a normal amount of heroin. However, when cut with fentanyl, the user only needs a slight fraction of the amount regularly used in order to overdose. When the user ingests a normal amount to them, but a product cut with powerful fentanyl, they become the victim of an overdose. The drugs they are used to taking have become extremely more potent and often the ultimate result of the overdose is death. Additionally, some street level dealers are creating fake pills that look like Oxycodone or Xanax that are actually pure fentanyl. Often, those purchasing the product believe what they are buying from the dealer is actually prescription drugs and are again in danger of overdose or death. The propensity of fentayl-caused overdoses is wide reaching. It is becoming so commonplace that many police officers and first responders in different areas of the country are no longer just carrying the opioid overdose reversal medication Narcan (or naloxone) to use on overdose victims, but also on themselves. There have been numerous reports of police officers and first responders who come into contact with fentanyl-laced heroin by touch or inhaling and immediately go into an overdose state requiring medical attention. The rise of fentanyl-related overdoses and fentanyl’s availability on the street, either as laced heroin or by itself, is due to the ease and availability of the medication. Fentanyl can be ordered on the internet and even shipped through the mail or through standard shipping companies like FedEx or UPS. Police stations around the country report arresting drug dealers who have had the medication shipped to their homes. The increase in pain medication and opioid prescriptions pushed a larger number of the population into heroin use and the suppliers have found creative ways to meet demand. What that ultimately means for heroin users is that on any given day and any given time, they could be purchasing fentanyl-laced heroin. The truth of the situation is that any bag or vile could be laced and ultimately end in overdose or death. There is no way to tell. First, the simply yet difficult thing to do would be to stem the tide by reducing the amount of those addicted to opioids, meaning oversight for Big Pharma and oversight on medical prescribers handing out opioid prescriptions. Easier said than done. Additionally, police officers and first responders all need to be equipped with naloxone. Additionally, family members and loved ones that live with someone at high risk should also be educated, trained and equipped with naloxone. More oversight is needed on fentanyl itself, crackdowns on its availability and ease of sales online. However, as always in terms of addiction and the opioid epidemic, the major issue needs to be availability of treatment. Police officers, first responders, doctors, nurses and hospital emergency room workers need to be access points for those in need of treatment. Addiction treatment needs to be accessible to anyone in need. 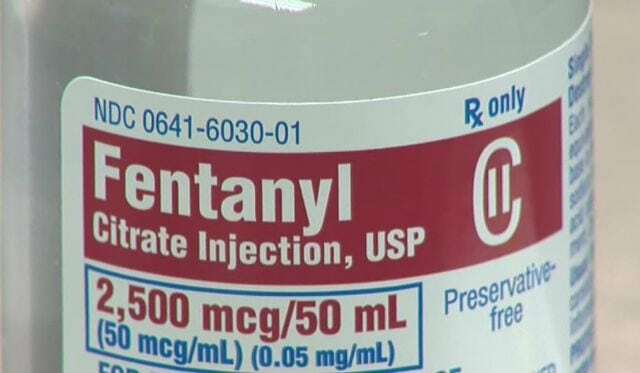 Education, prevention, life-saving medication and treatment will all have a large part to play if the country is going to be able to stem the tide of rising fentanyl-related overdoses and death. If you or someone you know is in need of help because of drug and/or alcohol abuse or addiction, please give us a call. Maryland Addiction Recovery Center offers the most comprehensive dual diagnosis addiction treatment in the Baltimore, Maryland, Washington, DC and Virginia area. If we aren’t the best fit for you or your loved one, we will take the necessary time to work with you to find a treatment center or provider that better fits your needs. Please call us at (888) 491-8447 or email our team at info@marylandaddictionrecovery.com. For more information on all of our drug addiction and alcohol addiction services and recovery resources, please visit our web site at www.marylandaddictionrecovery.com.